Saint Albans used to be called Rail City for all the train traffic it saw, but it could be known as Rail-Trail City now. 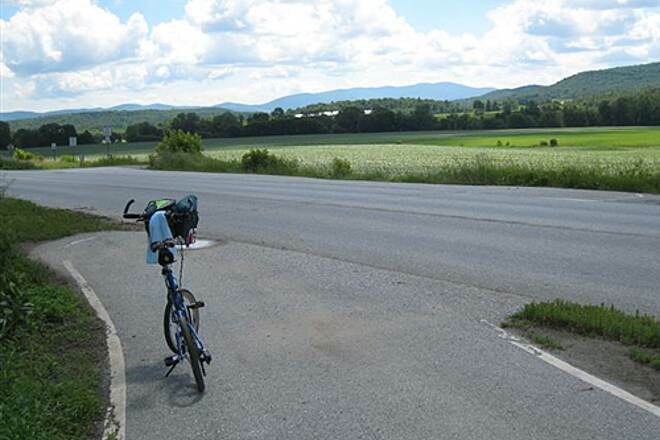 The town sits at the front door of the Missisquoi Valley Rail-Trail, among the longest and most scenic in the state. 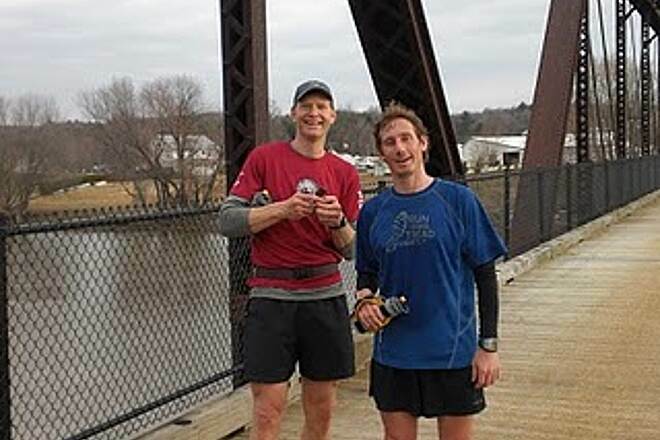 The 26.3-mile trail rolls past the dairy farms and cornfields of northwestern Vermont to within a couple of miles of the state’s border with Québec. 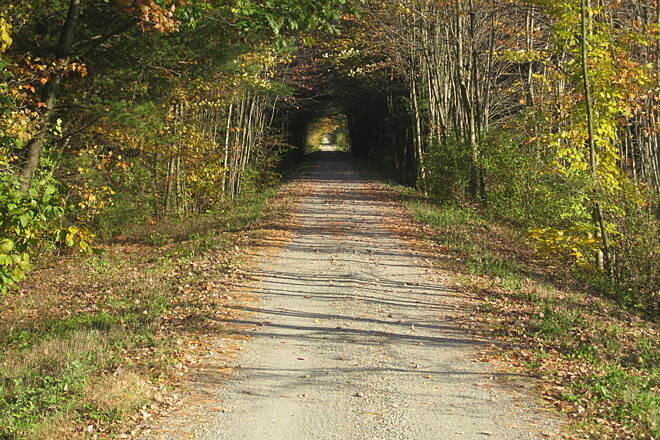 The crushed-stone trail follows the railbed of Central Vermont Railroad’s Richford Branch. 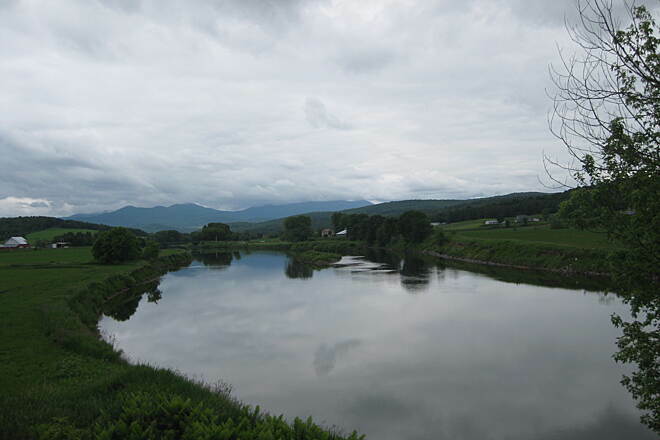 The line between Saint Albans and Richford was chartered as the Missisquoi Railroad in the late 1860s, and the much larger Central Vermont leased it in 1872. Eventually, the Central Vermont came under control of the Canadian National Railway. A train derailment on a trestle near Sheldon in June 1984 spelled the end of the line but raised an opportunity to build a rail-trail. One span was so badly damaged that the railroad decided it wasn’t cost effective to repair due to dwindling traffic. Local traffic on either side of the bridge continued sporadically for a few years, but the railroad discontinued use on it in the early 1990s. 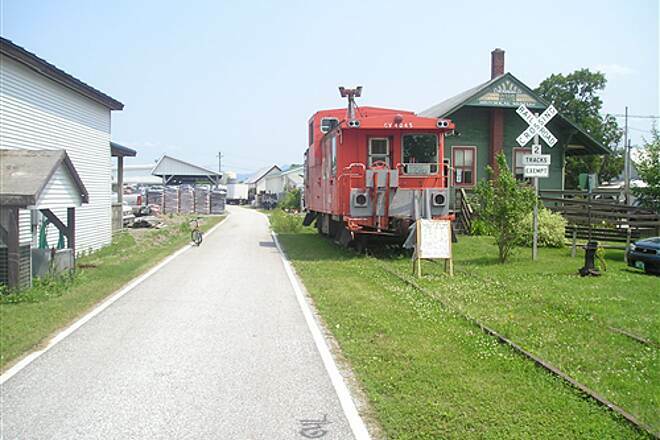 The trail starts on the north side of Saint Albans, in the midst of chain restaurants and mini-marts, although parts of town reflect its former life as a flourishing railroad junction. 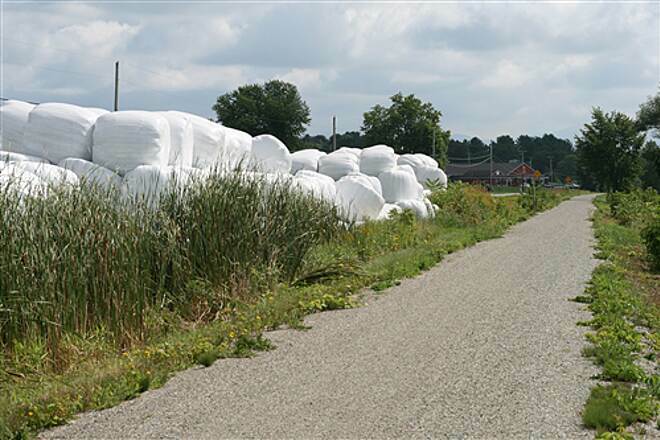 Heading northeast, within 2 miles you’re riding past cornfields, dairy farms, and red barns. 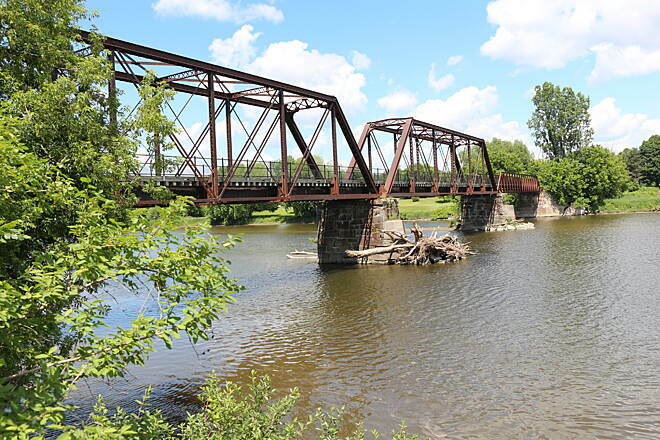 About 9 miles down the trail, you’ll cross a bridge over the Missisquoi River at Sheldon Junction; this is where the previously mentioned trail derailment occurred. The replacement span doesn’t match the other two here. At 523 feet, it’s the longest bridge on the trail. 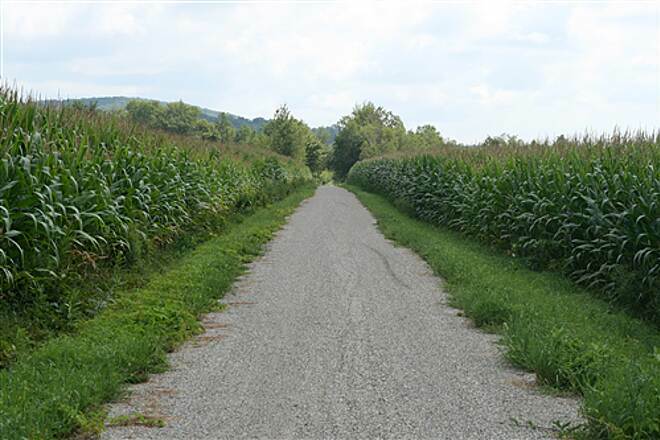 The next few miles are known as Corn Alley, as the corn grows right next to the trail. 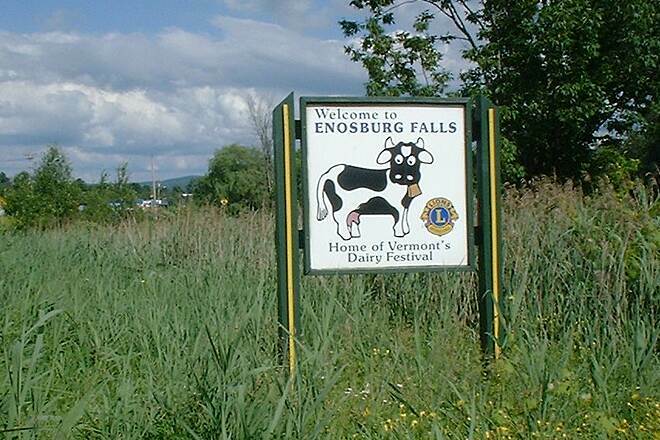 In 7.6 miles, you’ll arrive at Enosburg Falls, historically the center of the dairy industry in the area. The June Dairy Days festival relives those days the first weekend of the month. 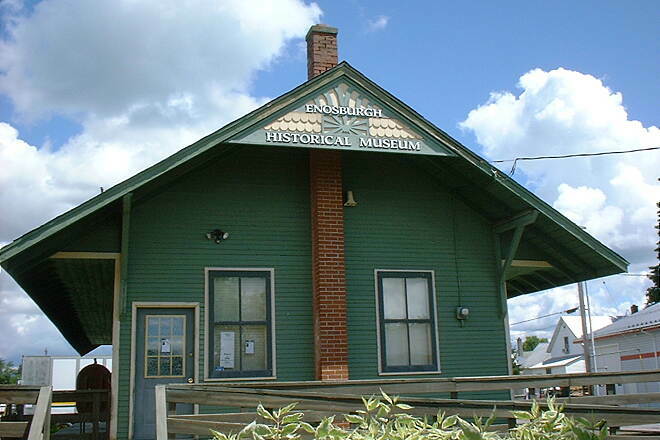 You’ll see a red caboose and freight depot; both house museum artifacts and local railroad memorabilia. They’re open June–October, Saturday, 10 a.m.–2 p.m. There’s shade at Lincoln Park a couple of blocks south on SR 108, and you’ll also find cafés, coffee shops, and an ice cream parlor in the vicinity. It’s mostly cornfields and pastureland for roughly the last 10 miles to Richford. 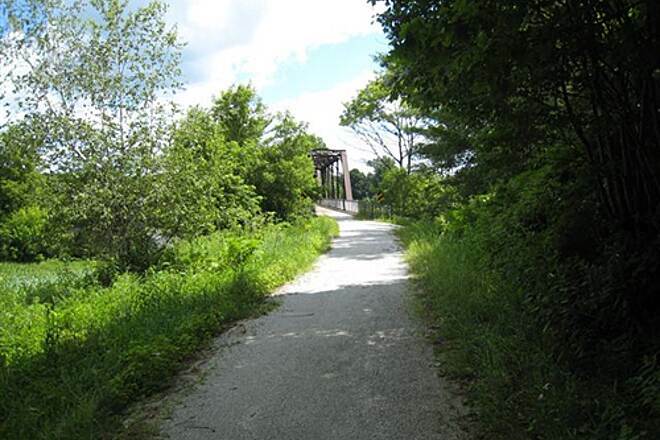 The last bridge on the trail is about 3 miles before Richford. 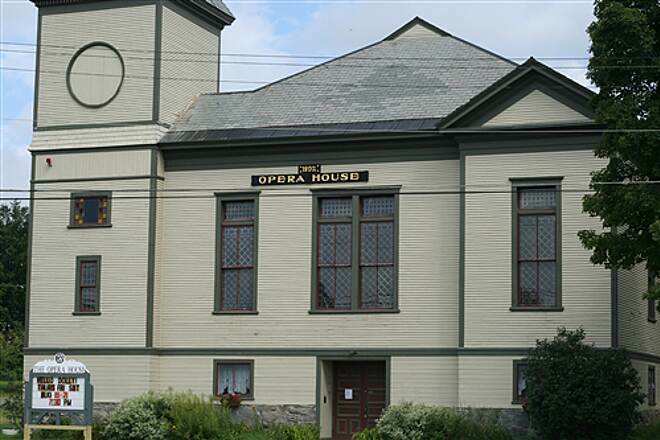 The Historic District of Richford is less than a mile away from the trailhead; to get there turn left onto Troy Street and right onto Main Street. Most of the historical buildings are concentrated near or at the junction with River Street just across the Missisquoi River. The river powered the mills here in boom times more than a century ago, but prosperity has abandoned the commercial district. Two blocks left on River Street you’ll see an example of a prominent businessman’s mansion built in 1890, now a bed-and-breakfast. 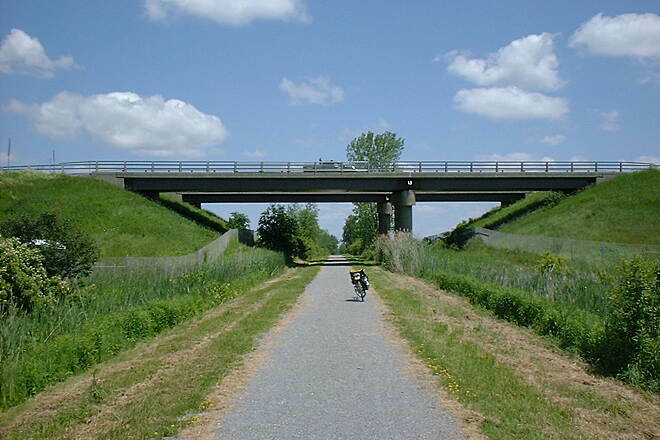 Plans are in the works to extend the trail to the Canadian border. 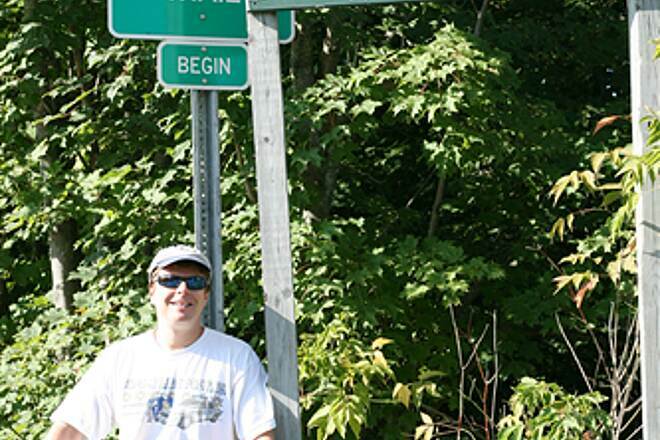 To reach the trailhead in Saint Albans from I-89, take Exit 20 onto SR 207/Highgate Road toward Saint Albans. Head southwest on SR 207, go 0.4 mile, and turn left onto US 7/Swanton Road. Go 1 mile, and turn left onto SR 105/Seymour Road. Go about 500 feet, and turn right into the parking area. The trail endpoint is 0.2 mile south. 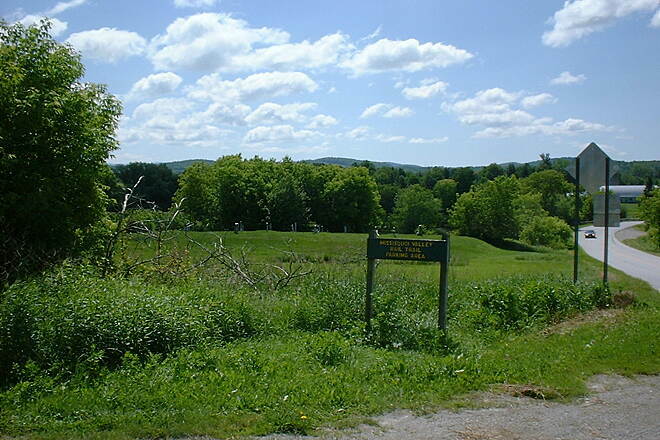 To reach the trailhead in Richford from I-89, take Exit 21 onto SR 78. Head east on SR 78, go 7.2 miles, and turn left to remain on VT 78. Go another 2.8 miles, and turn left onto SR 105. In 7.3 miles, turn left onto VT 108, and go 0.5 mile. Veer right to continue on SR 105, go 9.5 miles, and turn right onto SR 105/Troy St. In 0.4 mile look for parking at the trailhead on the right. Last weekend, my friends and I biked the trail from St. Albans. Except for a pizza restaurant, there were no services/portapotties at the Sheldon parking lot area as indicated on a local map of the trail. Because of the weather forecast we only went 15 miles North on the trail. The crushed gravel really slowed us down to about 7-8 mph. Though I had the appropriate tires, And I'm no speed demon, I don't like to ride that slowly. 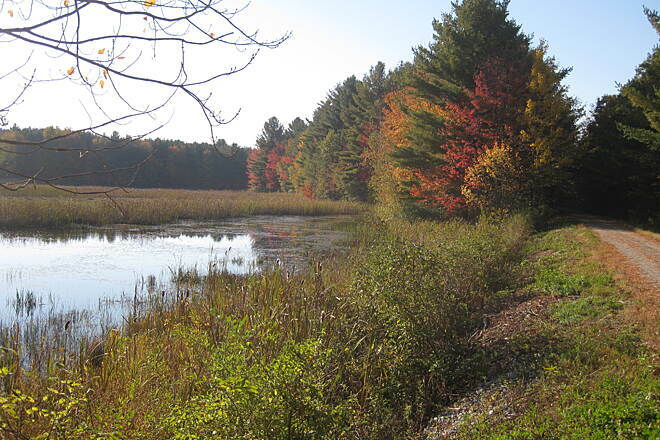 All said, What I saw was pretty, and I would be willing to bike this trail again from Richford. The southern leg of this ride was underwhelming. 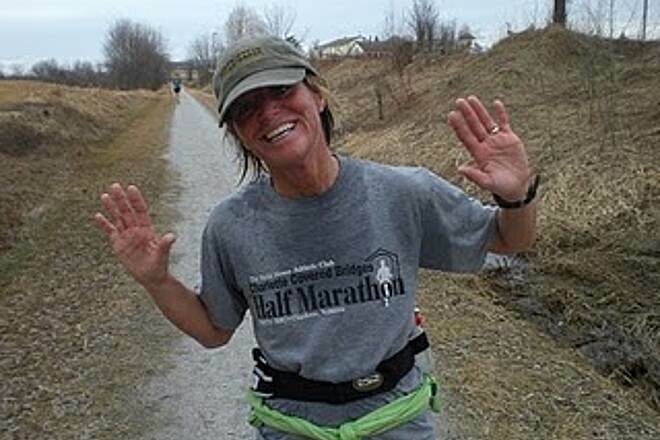 We did not think it is a boring trail, as another reviewer wrote. 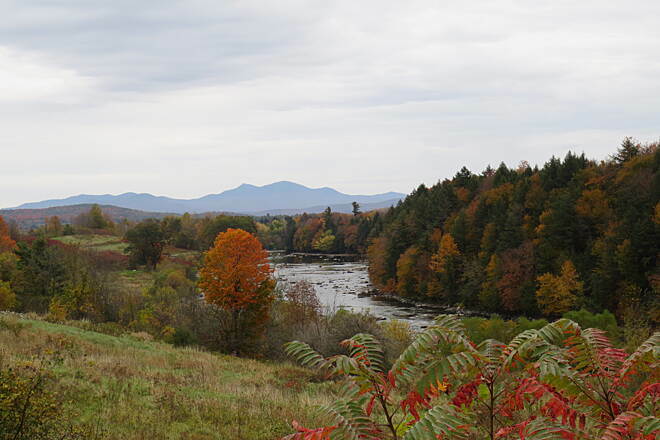 So much to see of the Vermont countryside! 10 miles out then turned around. Really flat and kinda boring. Not very shaded. Would be much prettier in the autumn. If your pleasure is peddling rural countryside, this is your destination. Small villages, rolling farmlands, rivers, hills, and a few mountains will fill your eyes. 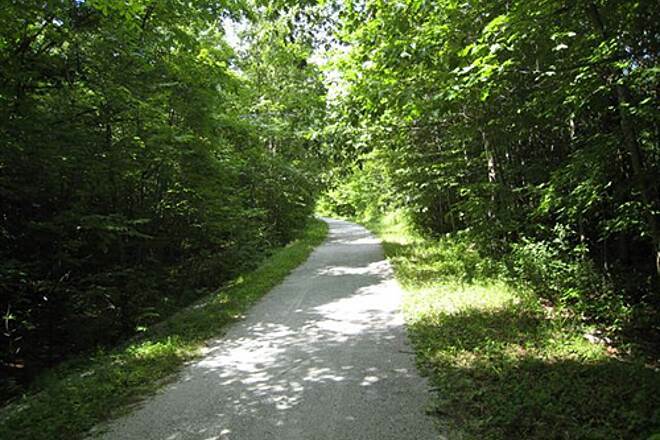 This trail features a great deal of open land, enhancing the visual experience, unlike many trails where you are usually in a tunnel of trees. Since I first found this trail, I have ridden it at least once a year. The length is just enough for a good workout for me. Do not be deceived; it is not flat. The surface of the trail is in wonderful shape. The crushed limestone surface is quite smooth and usually suitable for even the skinniest of tire. A hybrid would be the most comfortable. 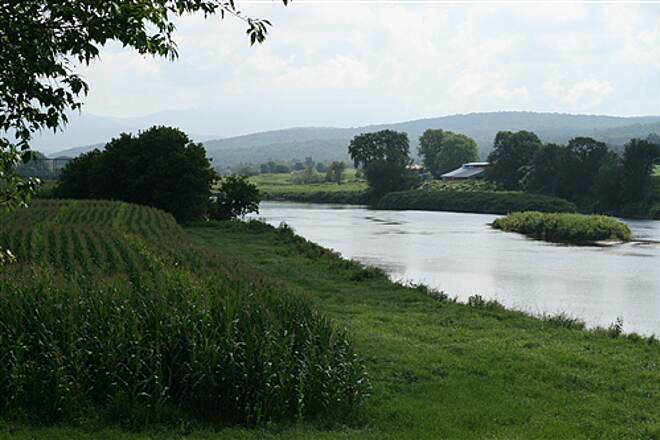 My attraction to this trail is twofold: the farms and the river. 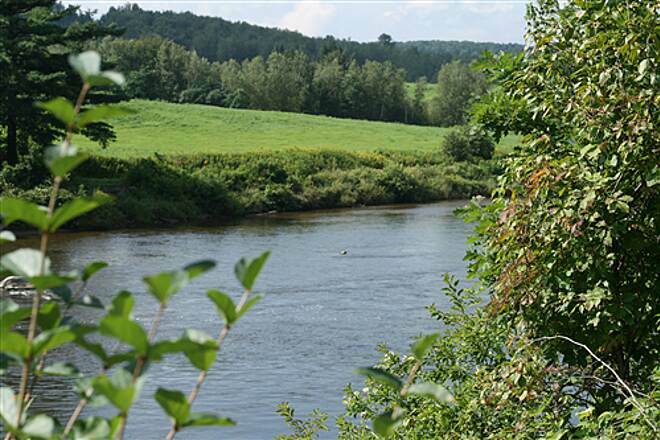 Much of the trail is close to the Missisquoi River, and the surrounding valleys are full of active farms. 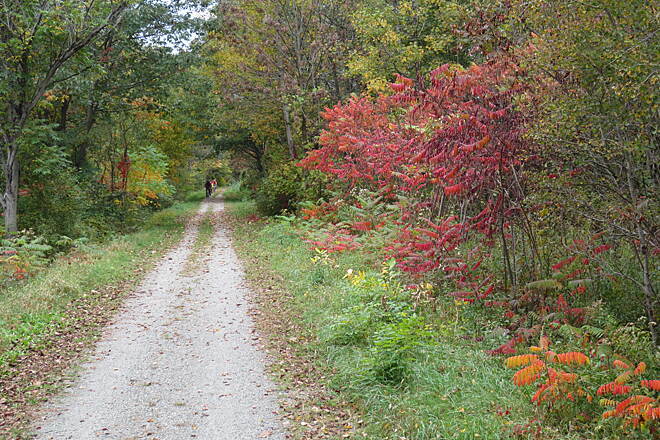 This year's ride in early October had farmers taking in the harvest and brilliantly colored foliage. The trail is beautiful in any season. You are never too far from civilization as you pass through several villages where you can get drinks and snacks. I can also recommend the Pine Cone Snack Bar east of East Berkshire. There is only one downside which is several at grade crossings across a somewhat busy rural highway. Just rode about 10 miles out from St Albans. 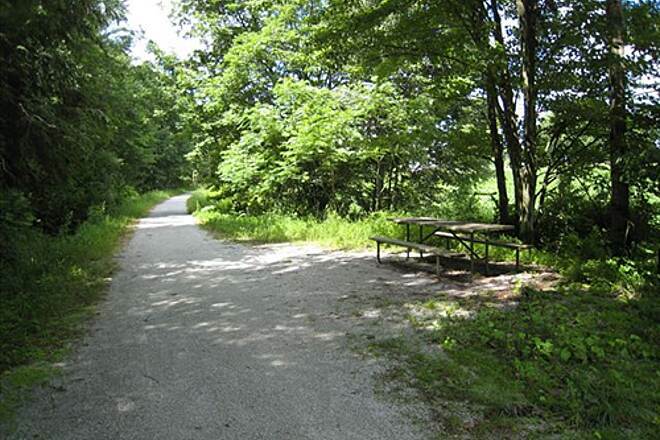 The trail is extremely well maintained. A couple crews were out cutting brush and felling trees along the trail today. The surface is superb. 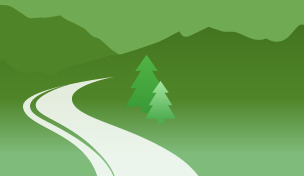 Best to have a hybrid tire or a wiwiwide road tire. 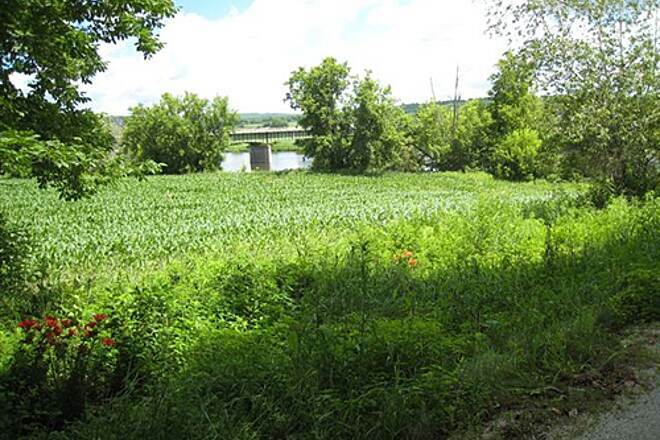 The views are mainly of cornfields and occasionally of the river but the ride is smooth with few stops. Thank you everyone for this trail! What a gem this one is. We did a ride from St Albans to Enosburg stopped for lunch and headed back. Well maintained for the most part, a little over grown near Enosburg. (grass needed cutting) For the most part we were alone so that made for some good side by side riding. 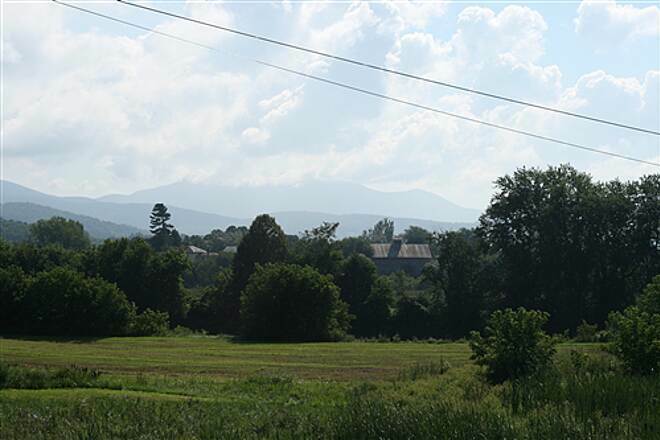 VT countryside at its best. Somewhat kid trailer friendly, just had to drop down a set of gears and all was well. Found the trail to be a bit challenging also, who would have thought a train could climb a hill that long. Pulling a child and a trailer was a great workout. Just a great beautiful ride. I rode this path on a weekday in May and encountered very few users, so it was smooth sailing. I started in St. Albans and rode to Richford, and then back again in about 6 hours. The path isn't entirely flat, and there are some long slow uphills, as well as long rewarding down hills. 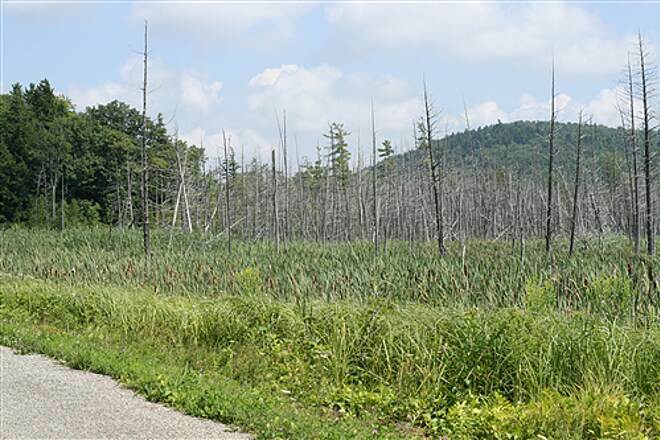 The path varies between gravel and dirt, and crosses Route 105, a 55 mph road several times, which can be disruptive to the flow of the ride. 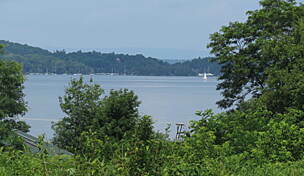 The river is only visible from time to time, for the most part you're riding past cow farms and parallel to Route 105. Road the trail end to end to end on a lovely October day. The trail was very scenic and well maintained. We used road bikes with skinny tires and had no problems, though hybrid bikes would probably be ideal. The map/trail guide on-line and at the trail heads was excellent and helped us find food and beverage along the way. We saw other people walking, running and riding the trail, but it was definitely not crowded on a weekday. We highly recommend this trail to anyone. 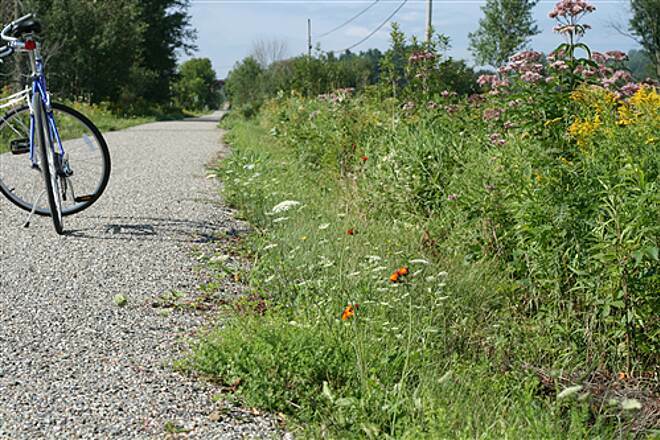 The Missisquoi Valley Rail-Trail is a gem! My husband & I have ridden our horses on this trail from one end to the other! We would ride different sections for a few miles. We started in St Albans (a few yrs ago) & completed it in Richford, last summer. Some sections we have ridden several times. The scenery through most of the trail is really great. It is well maintained from start to finish. Everyone we have met along the trail have been friendly. (Yes, we do respect the trail, and remove any "fertilizer" our horses leave off the trail into the brush.) My favorite is between Sheldon & Enosburg Falls. The trail is great. Hardly anyone on it. We took it in two sections. Roundtrip St. Albans to Enosberg Falls, then Enosberg to Richford round trip, so that we did the entire trail, just a nice lunch break in between. Highly recommend it. Lots of benches to sit and admire the views. 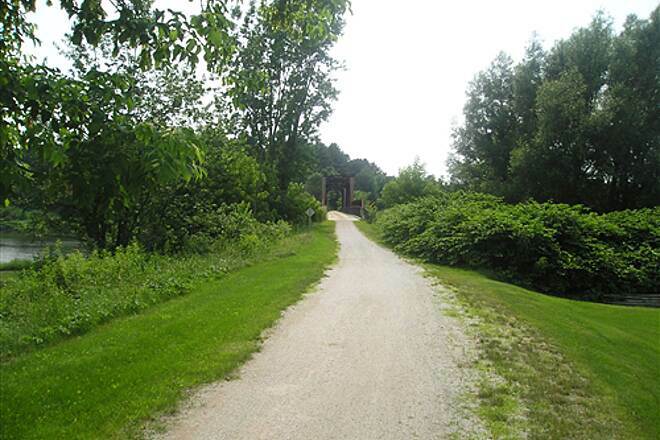 I researched on this site and found this trail after a most frustrating ride on my tandem with my six year old son and pulling my four year old daughter in her Burley trailer on the Island Line Rail Trail in Burlington. 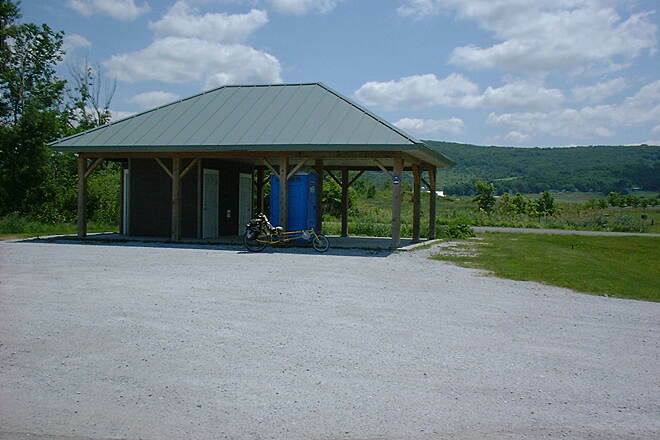 The Missisquoi trail has an easily accesible parking area in St. Albans where we were able to assemble our bike and gear, and quickly get moving with our ride. Fellow cyclists parking at lot drove cautiously, which was a great relief to me as a parent who often has to keep my kids away from traffic. 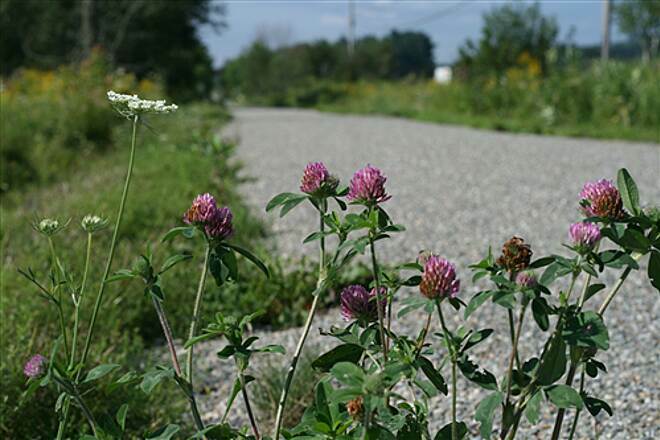 While I would have preferred a paved trail, this was the next best thing: The trail was well-graded and packed and the gravel was composed of fine and small cinders which was minimally resistant to our pedalling. We did ride considerably slower than we would have on pavement, but this was mostly due to riding on 700x28 road tires - 700x32 hybrid tires would have been more efficient. The trail was wide enough for us and cyclists going in both directions, and the cyclists we encountered were friendly and helpful (one gentleman we saw was fixing a flat for a fellow cyclist and giving an impromptu block of instruction on how to use a patch kit). We stopped in Sheldon Springs at a convenience store, and people there were likewise down-to-earth and outgoing as the people we met on the trail. We also got a great workout from the grades, most of which ran a mile and a half to two miles. Easy to pull alone, not as easy with the kids, but quite manageable nonetheless. Altogether an excellent ride and workout! This is a fantastic trail. I rode it with my cousin Ron, a part-year resident of the area, on a sunny August morning with temps in the low 80s. I was staying in St. Albans, but rather than attempt a round trip, we started from the terminus in Richford (courtesy of a ride from Ron's wife Vielke), with the intent of biking all the way back to our camps on St. Albans Bay. The trail offered beautiful and expansive views of the valley and the surrounding mountains as we left Richford. 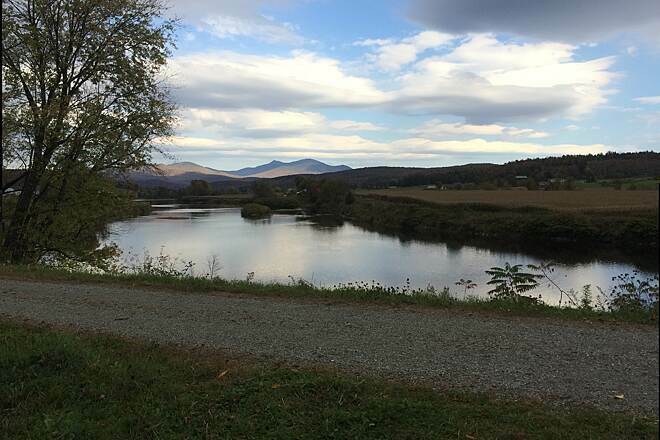 Moving toward Enosburg, we enjoyed a succession of picturesque glimpses of the Missisquoi river, which for much of that stretch meanders along the left-hand side of the trail (if you’re heading west) and where, at several points, the trail is probably 75-80 feet above the river. We found ourselves stopping constantly to take pictures, and contemplate the scenery. 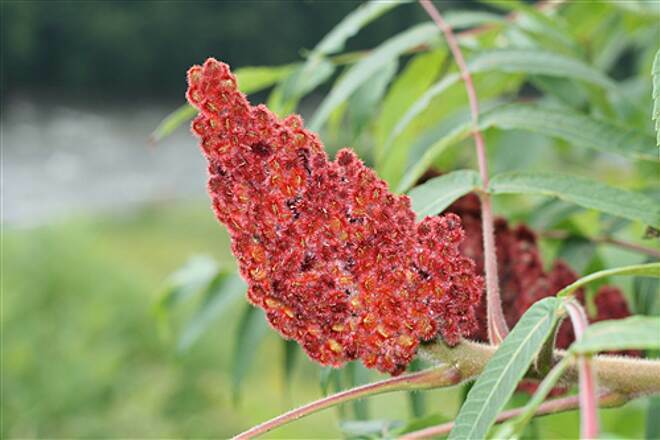 As we eased past dairy farms and rolling hills covered with pasture and hayfields, either side of the trail was populated with, among other flora, maple, birch, sumac, goldenrod, and red clover, Vermont’s state flower. Looking behind us and to the east, we enjoyed stunning views of Jay Peak (elevation 3,853 feet) and Little Jay. Moving past Enosburg and Sheldon, the trail became somewhat more wooded, though along its entire length we passed in and out of shaded areas, pasture, cornfields, and past a few residential areas. At one point, the trail cut a narrow swath through a cornfield where the stalks were easily 9-10 feet on either side of us, while at another point we passed a large marshy area, and dense forest beyond that. Aside from stopping for pictures, we took one rest stop in Sheldon, where we visited Devny's, a country mini-mart just off the trail, with an ice cream stand. A maple cremee was a great treat. The "small" size was pretty big; stretch out your fingers and look from the tip of your thumb to the end of your middle finger, and that’s about how much soft serve sat on the cone. 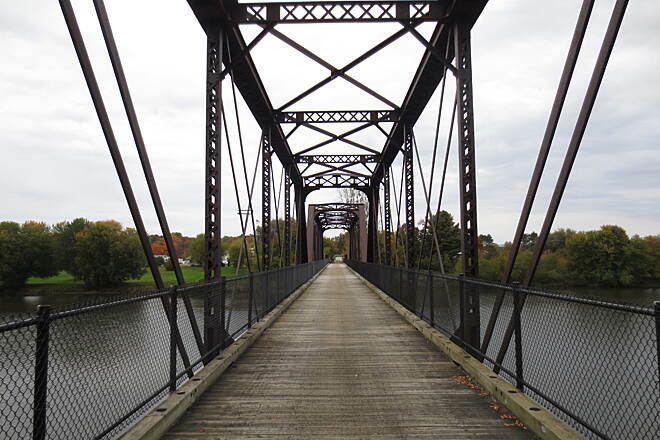 With a gut full of ice cream and Gatorade, we continued on, across the old trestle where the trail crosses the Missisquoi, and into longer stretches of more forested area. 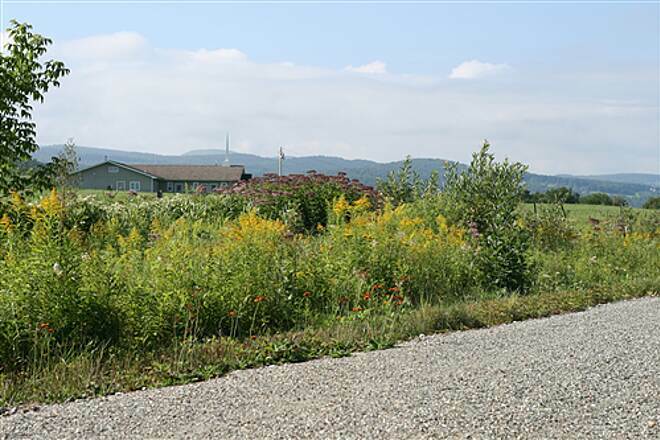 Closer to St. Albans, there are some beautiful homes along the trail, secluded in bucolic, spacious loveliness. 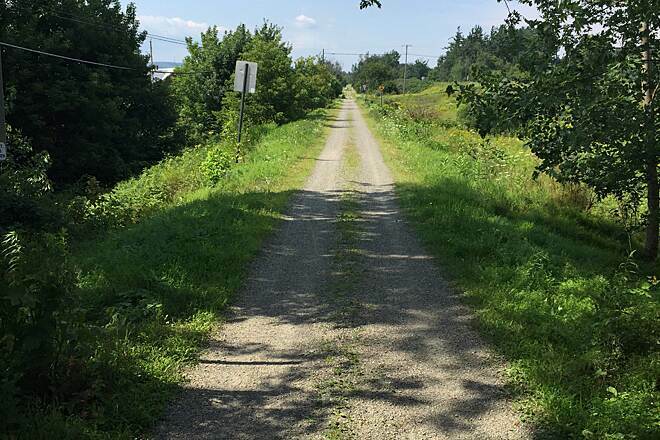 The final stretch into St. Albans is a slight upgrade, and opens up once again into broad farmland, before depositing us at the trailhead by Main Street. 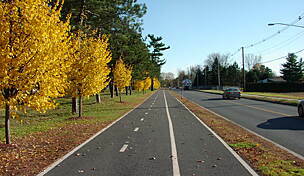 From there, we rode down Lake Street, which descends gradually but steadily down to St. Albans Bay, which in turn opens up to Lake Champlain. As a final treat on this last leg of our ride, we coasted down to the Bay, barely having to pedal for about three miles. For the most part, we had the trail to ourselves, as there were very few other bikers, and only a handful of walkers, joggers, and baby strollers. As a bonus, not once did I hear the "On your left" refrain as faster bikers zip past (something I hear constantly biking near my home, outside of Washington, DC). While I had not brought my own bike with me, I was able to rent one quickly, easily, and cheaply from White's Bikes on Rt. 7 in Georgia VT, a few miles south of St. Albans. I choose a Fuji hybrid, which was perfect for this the trail. The owner waived the rental fee on my helmet (something else I neglected to bring), and has detailed maps of the MVRT which he makes available for free. We rode the trail end-to-end on 8/26/08 for a total of 52 miles and rate it as one of the top ten best we've been on. We've done many, many trails throughout New England. 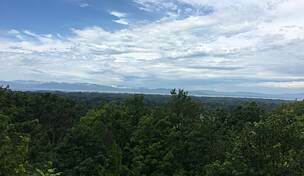 It was incredibly scenic in late August, passing for mile after pleasant mile through Vermont's lush green farmland and countryside. We saw oceans of corn in every direction as far as the eye could see. Passed by beautiful rivers and picture-postcard scenes everywhere you looked. Not one billboard or fast food joint anywhere. Just gorgeous! The trail itself was in perfect condition, crushed white stone the entire length. We rode on a Tuesday, so saw few other trail users. Weather was flawless, sunny and in the 70's. We were held up at two cow crossings on the way back, as the cows came back into the barn from a day in the fields, but even that was a fun part of the adventure, as we had a chance to talk briefly with the farmer herding the cows. 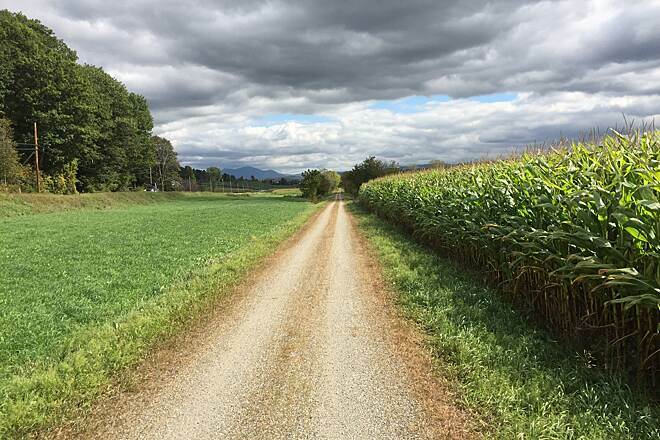 Trail is mostly level, with a variety of up and down-grades along the way, and passes through some small, quaint Vermont towns. Highly recommended!!!!! Riding the Missisquoi Valley trail was a primary objective on my July 4, 2008 trip to the Burlington and St. Albans area. 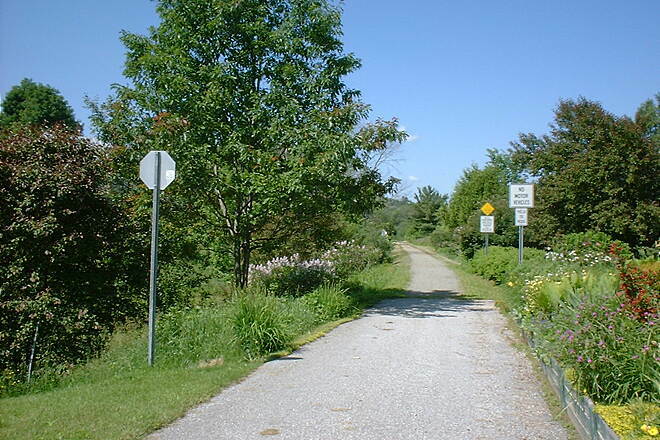 After reading the favorable reviews here, I was looking for a nice rail-trail experience to avoid the Vermont hills. 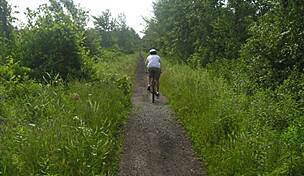 I can vouch that the Missisquoi Valley trail is still in fine condition and offers a nice, peaceful scenic ride. The crushed stone surface remains smooth, flat, and well-drained. There was almost nobody using the trail on the two days I was riding and scouting the area, so I was mainly alone. 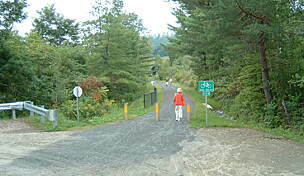 I planned to ride the rest of the Missisquoi Valley trail the next day starting from the other trailhead in Richford. But I decided to spend my day elsewhere when I saw that most of that part of the trail is open to the sun and runs by "fragrant" farms next to the highway (Rt. 105). 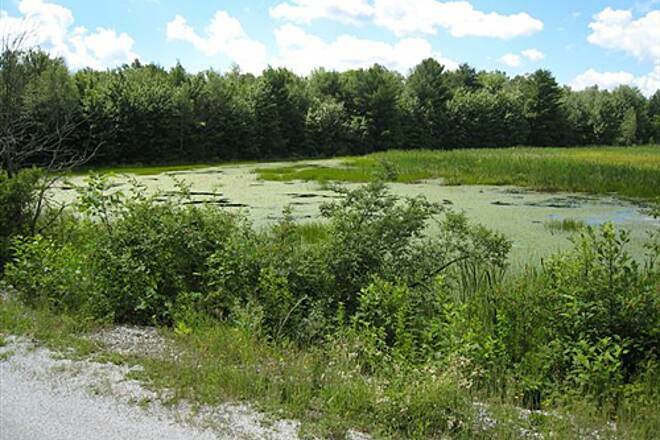 My decision was confirmed when I arrived in Richford and discovered it is a run-down and unattractive town with few amenities other than a couple of convenience stores. The actual trailhead in Richford is located in a shanty town of dilapidated house trailers and abandoned businesses with no parking area at all. Actually, this is one place where I would not have felt comfortable leaving my car, so I was happy to return to St. Albans. At the trailheads, I found nicely-done information displays and free copies of an excellent color printed map and guide to the Missisquoi Valley Rail Trail published by Northwest Regional Planning Commission. 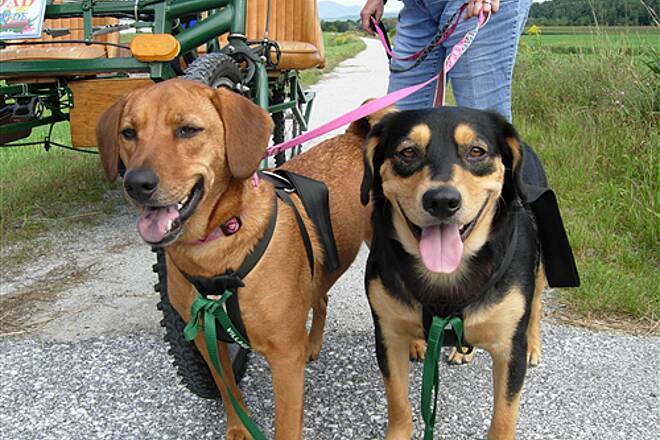 You can get an advance copy from them at 155 Lake Street, St. Albans, VT 05478 (802-524-5958). This map and guide provides lots of background information about the segments of the trail, and gives information on toilet facilities and picnic tables. There are no actual toilets along the trail, but the guide lists local businesses that permit trail users to have access to their facilities. 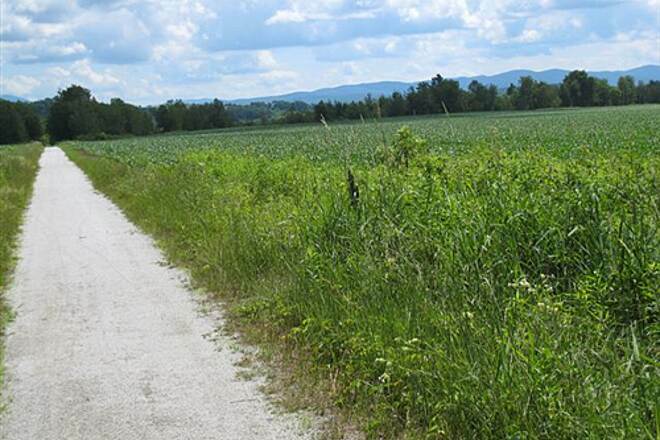 Overall, I highly recommend the Missisquoi Valley trail if you start and return to St. Albans. You can skip the Richford end of the trail without remorse unless you want to complete the whole 26 miles and return in one day. I will post a picture of the trail. Great trail plus another country! What a great trail but you definately need a mountain or hybrid bike to enjoy the trip. 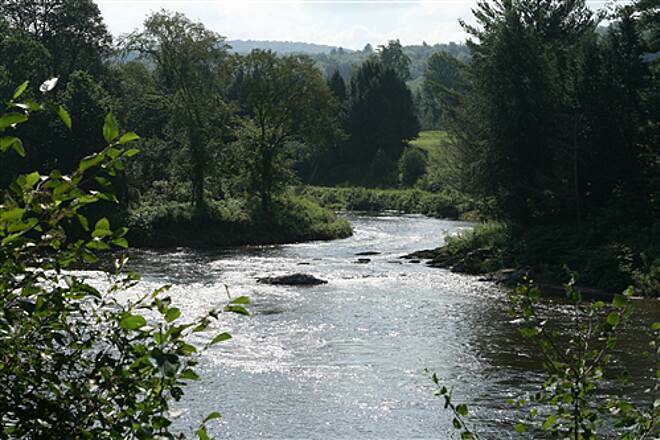 An added bonus is continuing over the border into Sutton in Quebec for great restaurants and much better accommodation choices thn you can find in Richford. I stayed at Vert Le Mont B&B wich is very cyclist friendly. Started about noon in St. Albans for our first ride on this trail. Skies were overcast with rain forecast. Rode 13 miles and returned. The crushed limestone trail is a fast surface but also aesthetically pleasing - not ridden on a ribbon of white before. 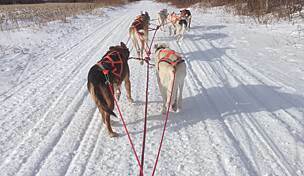 The up-grades were a little steeper than we're used to in southern N.E., but we still averaged our usual 10 miles/hour. 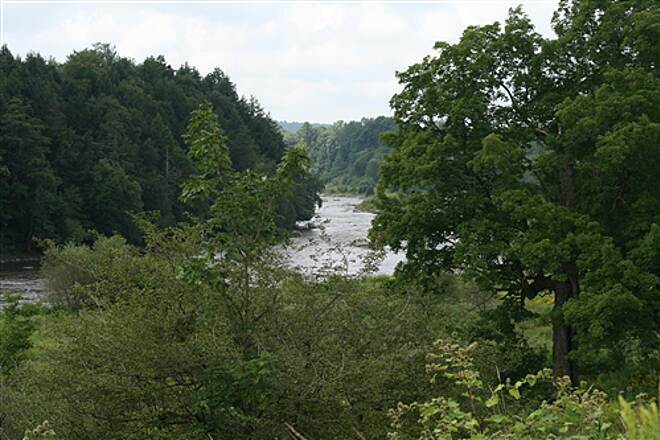 Mostly rural and wooded with some scenic spots an a river crossing. The ride beyond Sheldon had evidence of RTV's but no resultant trail degradation. We encountered an ATV and a motor-bike - another first, and only a few other bikers. The last five miles back to St. Albans was in the rain - another first. 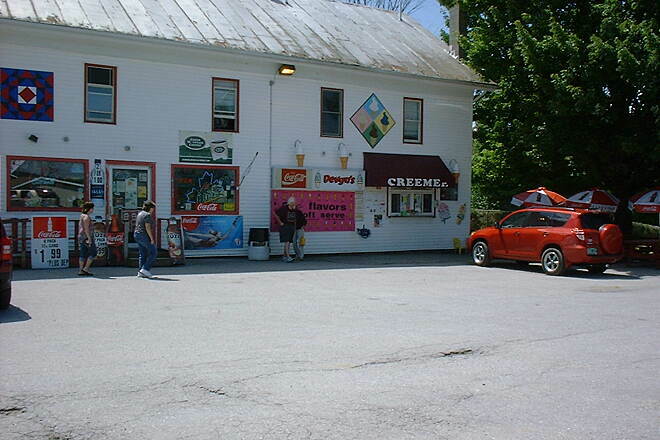 There's a ""creamy"" at Rt 7 entrance - a treat we look for to end a ride. ""Twas a great ride and look foreward to doing the entire 26 miles. 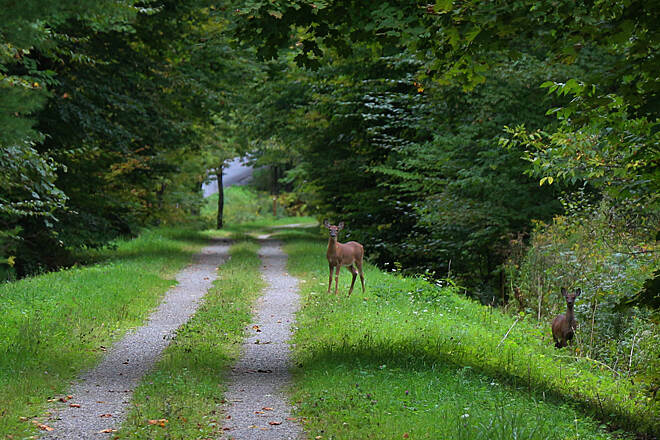 Thanks Vermonters for a trail well done. " A wonderful crushed stone trail. The trail is in good condition except for the occasional soft spot or eroded area. Trail winds through dairy country and along side a beautiful river. Best to start in St. Albans where there are hotel chains such as Comfort Inn and Econolodge. Good restaurants in st. Albans aa well. We were surprised there wasn't much trial traffic but it was a hot day. Lots of fun! 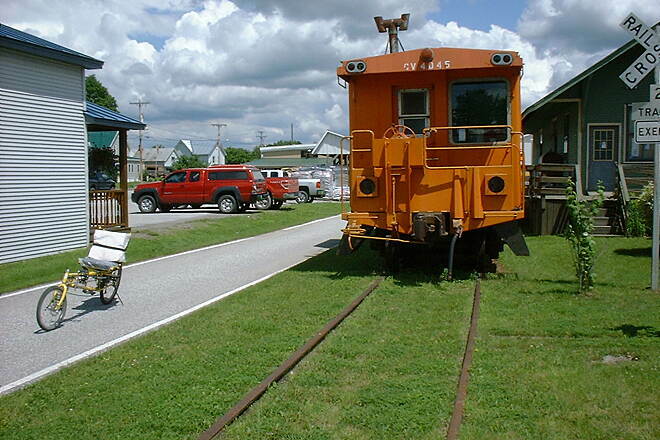 "I rode this trail in the fall of 2002, from outside St. Albans to Enosburg Falls and back. 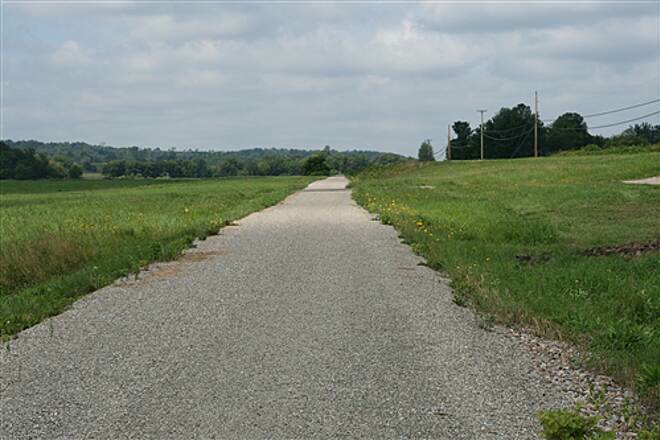 This is a baeutiful trail with an excellent stone dust surface." 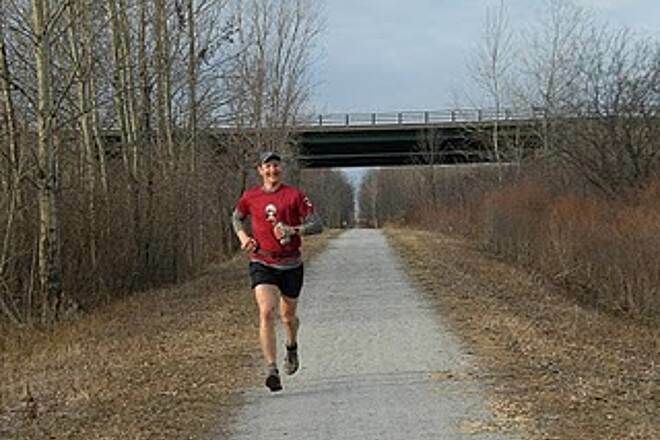 "I learned of the Missisquoi Valley Rail-Trail (MVRT) a couple years ago and decided I wanted to walk it during a trip back home to St. Albans in early August 2002. 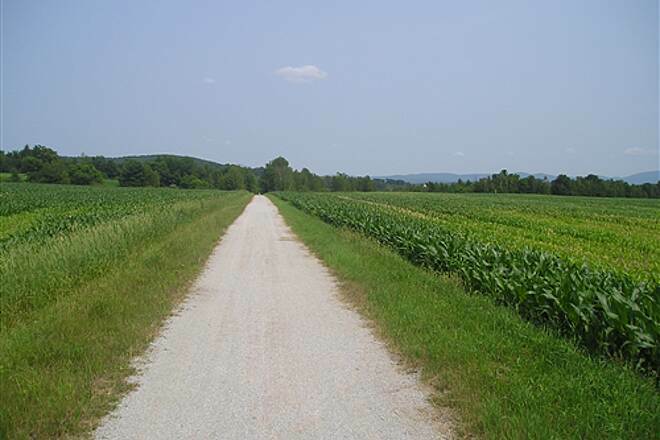 The trail starts near the Messenger Building on Route 7 and continues northwest across some of the best farmland in the state. The effects of early season rains were evidenced by some spots of drowned corn, but immense stalks lined the route for much of this area, which made it quite nice. Crossing route 105 brings you to an old graveyard. I stopped here for a break and checked out the gravestones, many of which date back to the early 1800's. I found this fascinating as I was familiar with some of the family names on the stones. I had driven past this place a hundred times in the past but never slowed down to take a look until now. The next four miles takes you through some pine forest and right through some front yards. I bet the owners of these houses prefer the trail over a railroad. I stopped at the Sheldon mini-mart for lunch and stretched out on the grass behind the building. It was a glorious summer day and it felt good to snooze in the cool breeze. The next segment of the journey is dominated by the Mississquoi River, which is very rocky and far down on the right hand side as you walk. The Abbey restaurant soon comes into view with its extremely trail friendly benches and bike rack. This type of support shouldn't go unrecognized and a stop in for a nice homecooked meal is a good way to say thanks. I was taking a 15 minute break every hour, and at around the 15 mile mark I took a full half hour. I don't recommend this, but I laid right down in the trail and fell asleep. The occasional car on 105 was the only noise other than the wind. Feeling refreshed, it was a short hop to Enosburg Falls. Enosburg is a booming metropolis on the MVRT and, with shopping centers and restaurants, another good place to find some food. I tanked up on water at the always-flowing drinking fountain in the park and headed out. 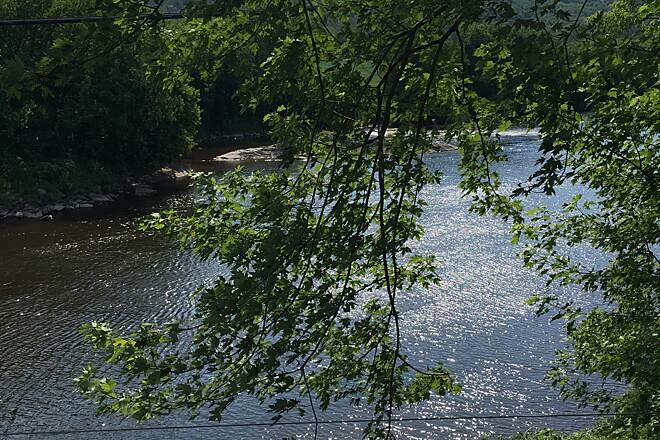 The trail in this area is the gem of the MVRT, with Jay Peak looming sharply, beautiful rural scenery and the quaint towns of Enosburg, East Berkshire, and Richford all within 10 miles. Quaint means something else here in Franklin County, if you're looking for the Cartier store here you may be dissapointed. These are working towns (o.k, so its a stretch to call East Berkshire a town) that bear little resemblance to touristy areas like Woodstock or Manchester. 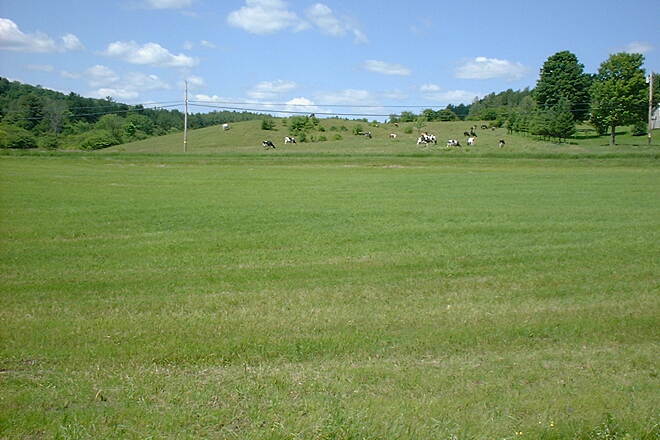 This the heart of the largest dairy county in the state. Passing the Dairy Center reminded me of a few wedding receptions, anniversary parties and other functions I attended there growing up. It also reminded me that the old place had seen better days. The trail crossed 105 several times and headed through East Berkshire. If it had been earlier in the day I definitely would have stopped at the Pine Cone snack bar. A genuine drive in snack bar meal would do wonders for my waning energy reserves, but Richford was only three miles away and the sun was getting low. An old train bridge crossed the Mississquoi which runs much deeper here than back in Sheldon. The last couple miles of trail move away from the road and back into the hills. Just before reaching Richford the sun set through a break in the trees with a fiery brilliance. It was nice reward after a long day of walking. The short walk through the ""suburbs"" led me to downtown Richford and the gas station/market on Main Street (I think it was a Sunoco). This is the meeting place for the local teenagers and Friday night was in full swing. A half dozen trucks congregated in the adjacent parking lot as younger kids ordered creemees at a window in the store. 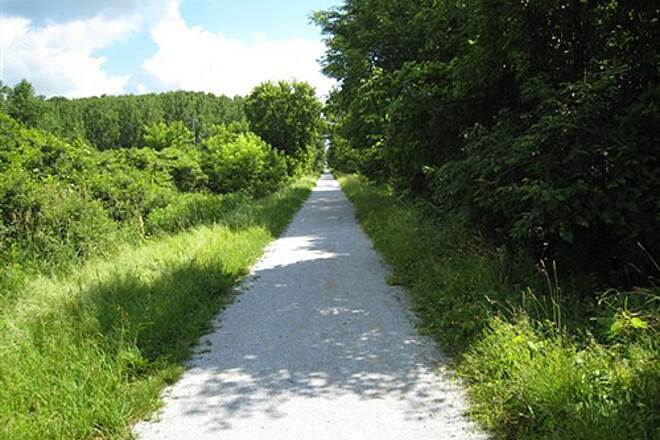 The finely crushed limestone railroad grade made walking easy. A group of bicyclists passed me on road bikes with their skinny tires and didn't seem to have any problems. I'm glad I walked it this time and got a chance to spend a full day outside in this beautiful country. This is real, working Vermont. 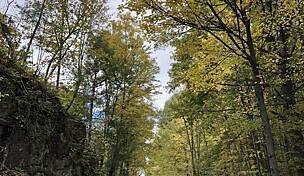 If you are looking for a shorter trip, try walking or biking the last 10 miles from Enosburg Falls to Richford as it was the most memorable.